I continue to be impressed with the consistently stunning 2006s from Tuscany. Most of the entry-level wines have been on the market for some time. As I have written here before, the vintage offers incredible quality from top to bottom in all of the region’s main appellations. Over the coming months many of the high-end bottlings will be arriving on retailers’s shelves. The best of these wines offer breathtaking richness in a style that marries ripeness with structure to a degree that has seldom, if ever, been seen in Tuscany. 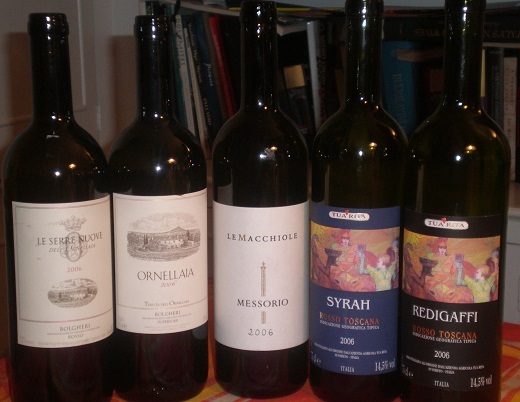 Although 2006 is very strong across the board, I couldn’t help notice that Maremma in particular was graced with a number of simply profound wines that readers won’t want to miss. The 2006s are big, full-bodied wines loaded with super-ripe fruit, but with plenty of stuffing underneath. In many cases the wines were made in the last month or so of the growing season, particularly in Chianti Classico, where warm daytime temperatures alternated with cool evenings. These conditions extended the grapes’ hang time and allowed the fruit to reach full phenolic ripeness while achieving maximum development of aromatics, acidity and structure. Growers had the luxury and peace of mind to harvest without being rushed. In a few spots producers reported harvesting into October, particularly for the Sangioveses. The 2006s will be tempting to drink young for their opulent fruit, but the best wines have the potential to age gracefully for many years. If the vintage has a weak spot it is the dry tannins that show up in a few wines where the warm conditions did not allow growers to achieve the level of sweetness and ripeness in the tannins that was evident in 2004. Based on what I have tasted so far, 2007 is shaping up to be another potentially outstanding vintage in many parts of Tuscany. Weather was much more irregular in 2008, but where hail and the cool, wet spring weren’t too much of an issue, early reports are promising. This is especially for true for later-ripening varieties such as Sangiovese and Cabernet Sauvignon which had time to recover from the difficult spring and benefited fully from the gorgeous late September and early October weather.